"What do you see when you look in the mirror? Some see a canvas, waiting to be filled in." How different is elaborate tribal face-painting from the use of "pigment and powder" in Western culture female makeup? The concept of modifying the human body, whether as art or as part of some deeper cultural imperative, has roots in almost every corner of the globe, and has been for centuries. This Learning Channel special covers not only the more well-known art of the tattoo, which comes across as incredibly tame here, but also investigates a number of other body-altering cultural phenomena that seek to use the human form as a canvas of some sort. Narrated by stern voiced Michael McGlone, this 50-minute film spends a lot of time comparing modern body modifications, whether tattoo or ritual scarring, with its tribal roots, and handily declares pain as a relevant part of the process, like bloodletting was once, in terms of being a rite of passage. 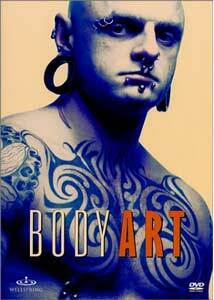 As expected from a Learning Channel project, Body Art is a condensed history lesson, and assembled in an enjoyably cohesive package. The art of tattoo, fascinating in and of itself, bookends the piece, but the subject matter extends far beyond that solitary, almost mundane, aspect of flesh art. From the elongated necks of Burmese women, to the shaped skulls of a remote African tribe, to the cheek piercing of Thailand, to Japanese irezumi, to the cosmetic surgery of Beverly Hills, it seems that adapting and forcing change on the human body is nothing new. Even the Japanese tradition of the geisha is explored here, and while not as extreme as some of the more permanent physical adjustments documented in Body Art, it is equally engaging and could have served as fodder for an entirely separate program. The range of material presented is pretty extensive, some of it far too brief, and it seems that this could easily have extended beyond the startlingly quick 50-minute production. Some of the footage is unpleasant to look at: the eyelid plastic surgery is as wince-inducing as the horribly deformed feet of Chinese women forced to wear tiny shoes. In its present form, though, Body Art is a concise, introductory look at what can be either considered curiosity, art, history or some amalgam of all three. I'm a fan of tattoos; I love the look, but I have to confess to not having a single drop of ink under my skin. This past summer, on vacation, we had the pleasure of meeting Enigma and Katzen, a pair of fairly well-known tattooed human canvasses. Afterwards, it was all my wife Jeanine, 10-year-old daughter Sammy and I could do to not stop at the neighborhood ink parlor and begin to transform ourselves. After watching this brief documentary, I feel completely naked without one. Image Transfer Review: Body Art has been released in the original televised 1.33:1 aspect ratio. Colors look good (not overly bright) and retain a natural hue, though not as sharp as a theatrical film. The disc retains the look of as a documentary, and looks as clean as a digital cable signal. Audio Transfer Review: There is little opportunity for a gratuitously robust soundtrack here, but the 2.0 surround track comes off fine; McGlone's narration has a substantial bottom end, as does Richard Fiocca's score. Rear channel cues are non-existent, but not wholly necessary in a documentary, either. Extras Review: Fifteen chapters, plenty on a 50-minute disc, are the only extras. I love a good Learning Channel special, and this one is nicely done. It might not deserve a permanent place in your DVD library, but it does a fine job of connecting the historically global need to refine the human form for a variety of reasons, and is never dull. I suspect that mysterious musical legends The Residents might have learned a tip or two from New Guinea's eerie mudmen, but I can't prove it.